The day we tossed out all the chemical-laden cleaning products, we have never looked back. We can now eat from the bench without worrying about eating spray and wipe, let me show you how to clean without a toxic overload. 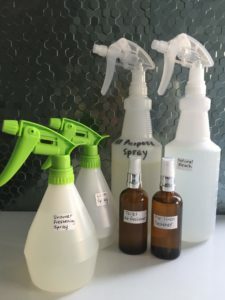 Using natural cleaning products instead of commercial ones will make cleaning easier on the hands, nose and on the body. No more sore hands, no more toxic smells, no more worry. Adding essential oils to water, baking soda or vinegar will have your house smelling amazing and fresh. These essential oils are natural degreasers and have antimicrobial properties. Yes! They really do work. Here are some examples of what we use. Store with as minimal exposure to light. It will last up to 1 month in a clear bottle, 2-3 months in a dark bottle. 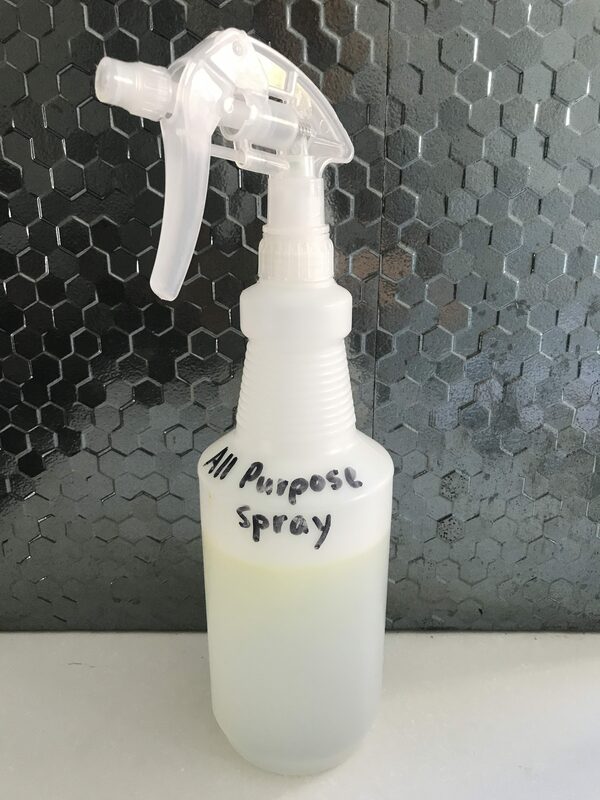 Combine all ingredients in a spray bottle. Shake Well! Spray and wipe clean on any surface. Combine and shake well in a spray bottle. 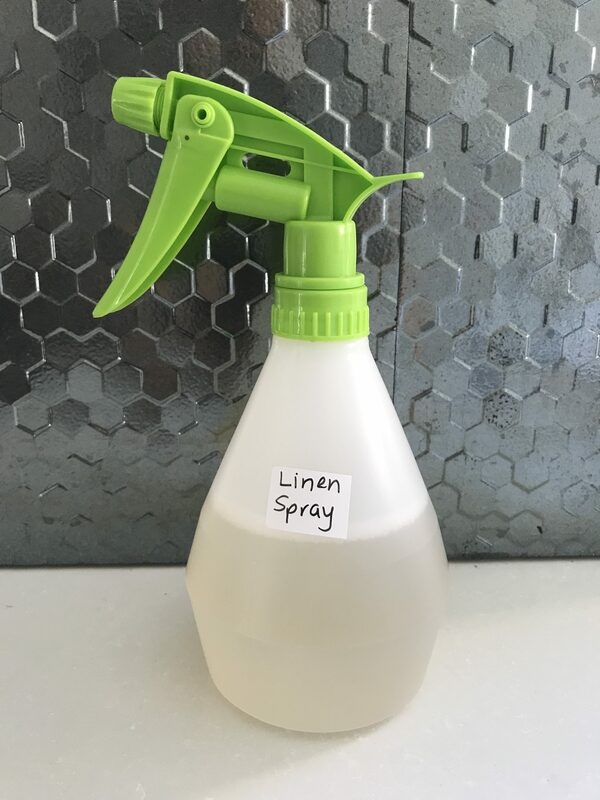 Combine in a spray bottle and keep in the shower. Spray shower down daily after use (this is a preventative spray, that helps prevent scum build up). Yes! I can set up a wholesale account for you. Just shoot me an email nikki@ubershape.com.au. Let us know how you go with this, would love to hear how your skin feels and if you have noticed a big difference. Plastic FREE July is simply about reducing your ‘plastic use’ the best you can. We are excited to take part in this initiative so why not give it a go yourself. Here is a staggering fact… In 1 week we go through 10 billion plastic bags worldwide and over 500 million straws are used daily! Plastic Free July focuses on refusing, reducing and reusing. Recycling is important but it won’t be the solution. There are health impacts to plastic. With food and drink being stored and cooked in plastic. Common additives to plastic include BPA (bisphenol A) and phthalates, both chemicals which have harmful effects on humans. It also impacts our wildlife, with entanglement and ingestion. It is estimated that 80% of the oceans marine debris has come from the land (www.plasticfreejuly.org). We have bought glass containers from IKEA to store our food in and use as containers throughout the week for our food/ meal prep. Re-use fermented veggies containers for storing our tea leaves. We purchase the super-soft, 100% recycled toilet paper, from “Who Gives A Crap.” This company donates 50% of profits to build toilets in the developing world. Instead of cling wrap we use the beeswax food wrap. We have only bought a few because we wash then re-use it. We buy from the Source Bulk Foods Miami. Produce bags from ‘ONYA are handy too. We use these at the markets and when we go to the supermarket during the week. Stainless steel or glass water bottles instead of plastic. (Here at our Gold Coast Personal Training Gym we give our clients 20 burpees if they bring a plastic one) WE REALLY DO! We find it easier to be plastic free July at the markets as we do bring our own reusable netting bags and the big basket and we are set. Adopting this way of living will encourage you to be more mindful of your plastic consumption. Overall, the difference YOU will make on the environment has a huge impact. It may seem small but everything counts. Let us know how you go & if you do some of these ideas; we would love to know. To take the challenge, you can sign up online on their official website and commit to it. They will email you ideas and encourage you along the way. Check it out! Protein, the building blocks of life, are an important fuel source. Yes! Carbs are also our friend. The plan is to eat more carbs on training days and more fat on non-training days. 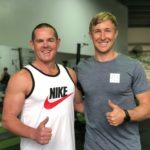 Friday night through Sunday will be slightly more lax, however, very important to remain focussed and select good choices still so you don’t waste a whole week of training at our Gold Coast Personal Training Gym, see recipe below Muscle Protein Shake. Other ways to get the calories up are some non-paleo things; specifically rice and oats. You can mix up what it is for the day, be sweet potatoes, oats, or rice. Mix all these ingredients in a powerful blender and serve. This shake is perfect for boosting your calories after your strength session. Try to drink this right after training or late at night for a snack for building muscle. All combined, it comes out to around 400-600 calories. An easy solution to getting that many calories/carbs so quickly and easily. 1. Foam rollers will help prevent injury by mobilising muscle & getting it ready for use before exercise. 2. The better you move the more fat you will burn. The more muscle you activate when doing any exercise the more energy it will cost the body= more body fat burned. 3. Reduce lower back pain. Lying on a foam roller long ways will help open up the spine, 10-15 minutes for the most effective release. 6.Serve on some crunchy spinach leaves with some avocado smash and salsa. Squeeze lemon over the chicken, This makes the most sensational crunchy chicken pieces! In amongst it all we need to remember to look after ourselves and keep centred, in order to maintain health through our bodies and mind which will enhance happiness. 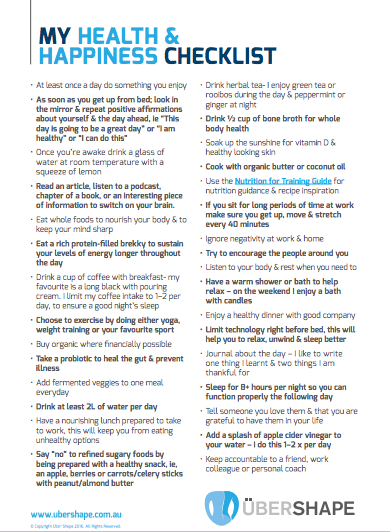 Below we have written a ‘Health and Happiness Checklist.’ Read over it and use it as a go to when life feels tough. Print off the list and put it on the fridge, pick a bunch of things off the list and make them a new habit by ticking them off daily. Keep adding to the highlighted items as you get better at prioritising you. Looking after yourself is often the last thing we choose to do, yet it’s the most important and it will improve all areas of your life! How are you loving yourself today? Shave the zucchini with a julienne peeler (or normal peeler then slice thinly making thin and skinny strips) making sure you squeeze as much excess water out of the zucchini as possible then leave on a paper towel to absorb anymore. Add your flour of choice, the beaten egg and spring onions into a bowl. 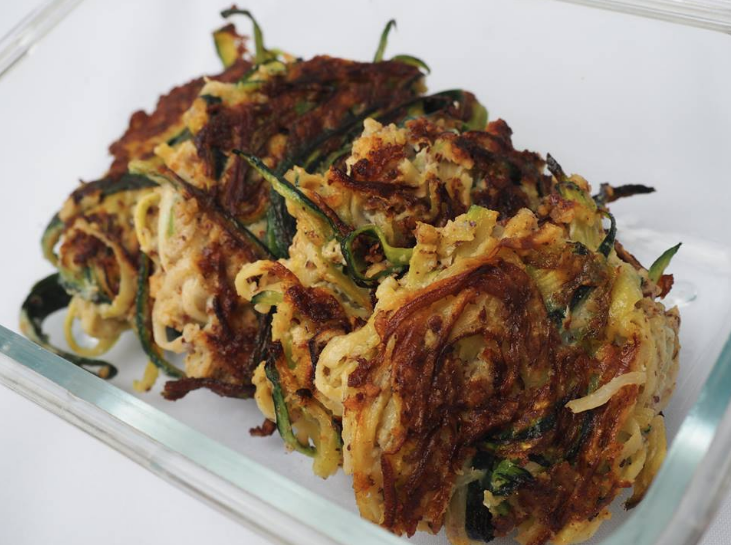 Make into firm flat fritters at your desired size. Fry in a good amount of butter, make sure they are fully cooked on that side before you try to flip or they will break. Cook on the other side. See our #1 Post Workout Meal! What is ‘BONE BROTH’ all about? Up until a few years ago ‘bone broth’ wasn’t exactly a staple in the kitchen for health reasons; there’s no doubt that most didn’t even know what ‘bone broth’ was. The first time people hear about it, their stomach probably turns at the thought – something in the name perhaps. Bone broth is no longer just a stock liquid or cubes found in long-life cartons at the grocery store. The liquid gold I am referring to is the beautiful homemade hot drink known as ‘bone broth’. Cooked on the stovetop to nourish your body in practically every way. Science is now backing the humble liquid and what our grandparents knew before the 1950’s would heal almost anything. Sally Fallon explains, “It was at this time large companies discovered how to produce meat like flavours in a laboratory and adopted MSG from Japan to enhance the food like flavours”. That’s when the shelf-life stock was born and lost all its nutritional qualities while filling our cooking with chemicals. Instead of healing and protecting our body from sickness and disease, and maintaining our bone health, it was filling us with false hope. 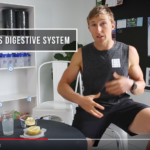 Recently, it has been proven that your health is largely dependent on your intestinal tract – meaning if you improve your inner health, your general health will follow. This gives bodies a stronger chance to fight off allergies, disease and common illnesses while keeping bones strong and skin young. So, what is compromising our health, ability to fight disease and our bone strength? How is this even possible, they’re just bones? The two main components that make bone broth such an everyday hero is the Collagen/ Gelatin and Healing Amino Acids. Bone Broth is the world’s best sources of natural collagen. 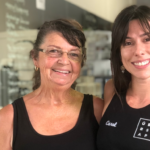 As the bone broth cooks, the collagen breaks down to a Gelatin from the animal parts (this is what gives your bone broth the jiggling, slightly jelly-look appearance) and leaches into the broth, which becomes readily absorbable to help restore cartilage. In addition, the animal bones also release glucosamine and chondroitin sulphate; these are the same nutrients doctors prescribe as supplements to keep joints healthy. All the immune boosting properties are only found in animals with a vertebrate – hence the chicken, beef, lamb and fish bones. The glycine found within collagen helps form muscle tissue by converting glucose into useable energy. It also slows cartilage, tissue and muscle loss associated with aging, by improving the body’s use of antioxidants. Studies have shown that the glycine protects muscle loss and stops the age-related muscle protein breakdown. 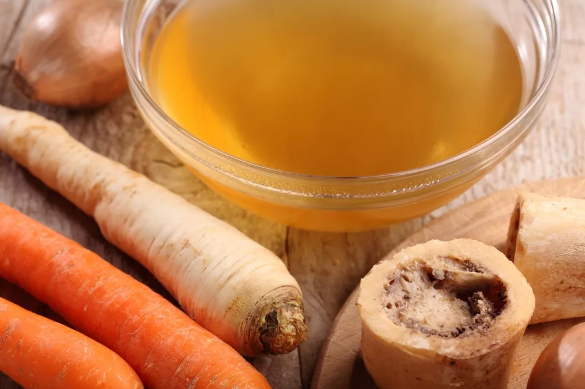 When the science behind ‘bone broth’ is explained, it sounds pretty amazing right? It is clearly evident why everyone is giving it a go, and the bonus is, so many people are seeing results. This is something that no GP can argue with. If you haven’t already tried it – I challenge you to give it a go. Your body will thank you for it – aim for a cup every day or two! -Breakfast is the most important meal of the day. Without it, you’re limiting your potential to perform during the day. -What you eat for breakfast sets up your entire neurotransmitter production (brain function) for the day. -If you consume a high carbohydrate breakfast you may find your self-reaching for those sweet afternoon snacks. Red meat is by far the most beneficial for all over performance and focus for the entire day. Clients that do consume this always train a lot harder and are more focused = better results..
Good fats from the nuts will help with a steady blood sugar rise. We use this for our clients who want to fast track their Fat Loss. It’s low inflammation meaning it’s great for the person who often gets an upset stomach or is always stressed. Turkey is very high in protein and low in fat. Use berries if you have an intolerance to nuts. This is a great alternative to meat & nuts if you are eating out at your local café. Adding a few simple nutrient dense ingredients in your blender is super easy and fast. Check out breakfast blast. 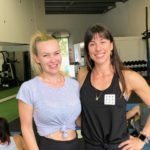 Do 12 week challenges work?